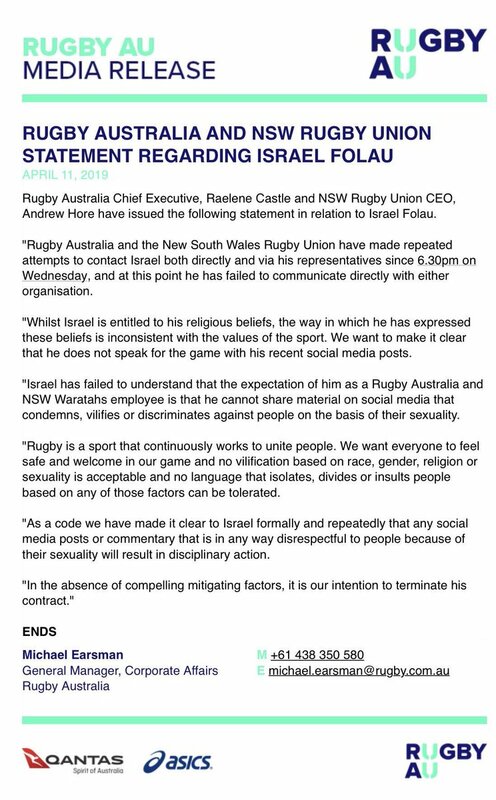 Rugby Australia says they intend to sack Israel Folau “In absence of compelling and mitigating factors, it is our intention to terminate his contract”. This dents Australia’s chances in the Rugby World Cup later this year, but they appear to have little choice, after Folau’s homophobic, forniphibic, idolphobic, fibaphobic, drunkaphobic social media post. Folau is finding that ‘free speech’ can have consequences, especially when one ignores contractual agreements not to repeat making divisive public statements. He said that just about everyone will go to hell if they don’t repent (which is a ludicrous concept), but his lack of repenting will guaranetee’s his sports career will go to hell. Test cricket is often quite slow moving (that’s part of it’s appeal for some of us). The second test between Sri Lanka and New Zealand, starting on boxing day, had a bit more action than usual, with New Zealand losing wickets steadily and getting to a paltry total of 178. Sri Lanka batting was similar on the second day – with four wickets falling for just 51 runs. There was a bit of a recovery, until Trent Boult’s amazing spell. Until then Boult had bowled well enough but without success. But he suddenly got things working for him and got a wicket, and another. Both caught by Southee. Then Boult cleaned up the remaining four Sri Lankan batsmen LBW, all going for ducks. Boult set a world test record taking 5 wickets in 11 balls. The test is a long way from over but this devastating spell of bowling put New Zealand into a good position with a handy first innings lead, and then the Black Caps batsmen turned that into a strong position with a 305 run lead, only two wickets down in their second innings (finishing the day on 231 for 2). So good day for New Zealand, but an incredible day for Boult. There has been a lot of sport of interest this morning. I have been up since about 4:00 am and to be honest, blogging has not received my full attention. I have also kept an eye on the final LPGA tournament of the year (Lydia Ko is currently tied for 8th but again not quite looking to contest the top of the leaderboard). And I watched quite a bit of the Women’s cricket T20 match India versus Australia. Both these teams have beaten New Zealand to rule us out of advancing, but the quality of cricket in this game was excellent, with India ending up comfortably beating the Aussies. Currently it is Scotland versus South Africa. But roll on 8 am when the All Blacks versus Ireland will be a very interesting game to watch – between the best performing teams in the world at the moment. And at the same time the Maori All Blacks are playing Chile. Sky Sport is good value at times. A very intense close fought first half. Ireland deserve to lead 9-6 at half time (they probably deserve as bigger lead). And a full on second half, with the All Blacks making most of the play in the last half hour, but just too many critical mistakes and some poor options at times. They couldn’t score a try, and really didn’t look close to scoring. Ireland played their hearts out, particularly on defence, and deserved the win. The All Blacks are playing England (for the first time in four years) this morning at Twickenham. England started very well, scoring an early try, following up with a dro goal and then another try, to lead 15-0. They played well, pressuring the All Blacks into mistakes, and playing well tactically for the first thirty minutes. The All Blacks then changed tactics, worked away at making ground, capitalised in English mistakes and scored a try plus kicking a penalty right on half time to close the score to 15-10 to England. It has been raining throughout the game so conditions are playing a part, but both teams have managed that well. It should be a good second half. Not such a good second half. A drop goal and a penalty by the All Blacks to take a one point lead, and they dominated but had trouble breaking the English defence. The English reverted to formula footy and didn’t do enough. There was one quite controversial play when England charged down and scored a try, but the video ref ruled offside so they missed out. I think that the way the game is ruled these days it was offside. The offside enabled the charge down. And if the try had been awarded it is not certain it would have been converted (it would have been from the sideline), and there were two or three minutes left in which anything could have happened. And the ABs held on to close out a tight win. The English didn’t score in the last hour. Both teams will claim something out of that game but the bottom line is 16-15 to the All Blacks. There is more interest than usual in the test match this morning between the All Blacks and Springboks being played in Pretoria this morning. The Springboks won the first of two Rugby Championship games between New Zealand and South Africa in Wellington last month (36-34). There is more pressure than usual for the All Blacks – if they lose then the Springboks will be unbeaten against them in 2018. It is good to have a test with more interest at stake. One loss for the All Blacks is not uncommon but not a bad thing, but a second loss against the Springboks would be a major blow for them.